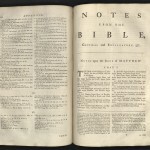 This is the first and only edition of the Bible of the Quakers. Samuel Fothergill (1715-1772) was a prominent Quaker of his generation. He spent two years, 1754-1756, in the American colonies, traveling almost 9,000 miles to attend Friends’ meetings in order to help strengthen their Quaker principles. 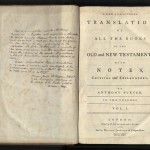 Earlier, he had become interested in Anthony Purver’s translation of the Bible and encouraged its publication in parts in 1746. Purver (1702-1777) was a Hampshire-born apprentice shoemaker-turned-Quaker-preacher. He learned Hebrew, Aramaic, Syriac, Greek, and Latin, and read massive amounts of Biblical criticism, including rabbinic commentary, and studied early English translations of the Bible. 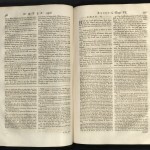 For his translation of the Bible, Purver added critical and explanatory notes. 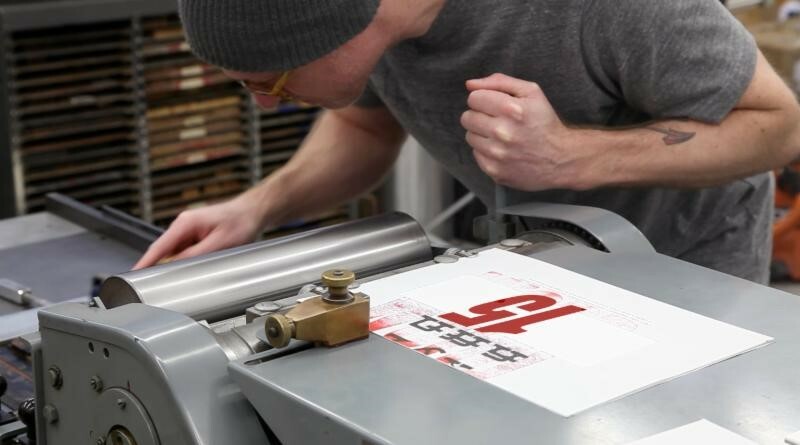 Purver contracted with Bristol printer Felix Farley to undertake the printing project. Purver’s enthusiasm waned and his work ground to a halt. 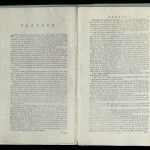 Fothergill urged Purver to persevere, and when Purver completed the work in 1763, he paid Purver for the copyright and published the edition at his own expense. The University of Utah copy is inscribed by Samuel Fothergill (1715-1772) to his niece on the front free endpaper of Volume I: “Doctor Fothergill/To his Niece S T/Now S. Hird.” An ink signature of Fothergill’s niece, Sarah Hird, is on the front free endpaper of Volume II. Book plate of Joseph Crosfield on the front pastedown of each volume. Joseph Crosfield was the brother of George Crosfield (1785-1847), who compiled Memoirs of the Life and Gospel Labours of Samuel Fothergill (1843). A note in a 19th century hand, appears on the verso of the leaf opposite the title-page in volume I. Our copy bound in contemporary speckled calf. 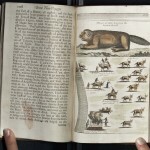 Daily Utah Chronicle reporter, Mary Royal, talks to Rare Books Managing Curator Luise Poulton, and Curator Alison Conner about rare books at the University of Utah. 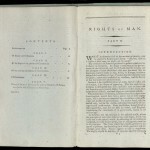 In Rights of Man, Thomas Paine defended the French Revolution against attacks made by Edmund Burke. Thomas Jefferson championed Rights of Man. 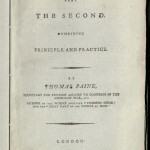 Paine was made a French citizen by the assembly in 1792 and was elected to the convention where he allied himself with the moderate republicans who lost power during the terror. Paine returned to the United States in 1802. 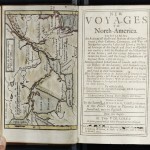 One hundred years before President Thomas Jefferson acquired the Louisiana Purchase, and seventy-three years before the United States came into existence, this was one of the most widely read travel narratives of early eighteenth-century America, detailing Indian life with maps and engraved plates. First published in French in the Netherlands, it was published in English in London the same year. 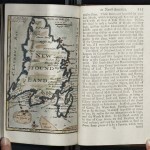 President Jefferson had a copy of this book in his personal library. 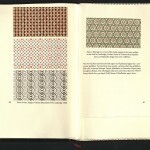 Elizabeth Friedlander (1903-1985) produced calligraphy and decorative designs for books from the 1920s until her death. 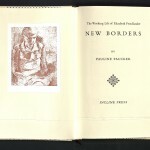 New Borders is based on her workbooks, which she kept throughout her life. Born into an affluent family, Friedlander studied typography and calligraphy at the Berlin Academy. She worked for the German fashion magazine, “Die Dame,” designing headings and lay-outs, and attracting the attention of Georg Hartmann of the Bauer Type Foundry in Frankfurt. He invited her to design a typeface. This was to become their Elisabeth-Antiqua. It was originally meant to be named Friedlander-Antiqua. However, Adolf Hitler came to power just as the type was ready to be cast. Hartmann suggested that the name be changed from her Jewish surname to her first name. The font was cut in 1939, after Friedlander left Germany. Under the Third Reich, Friedlander was forced to apply for official registration and was refused a work permit. She moved to Italy, where she was permitted to work so long as she did not become politically active. She learned Italian and worked with the publisher Mondadori, but in 1938, harsh Italian Race Laws threatened her employment. She moved to London, where she learned English and found a job as a domestic servant. Francis Meynell found work for her as a designer. By 1942, she was in charge of design at Ellic Howe’s propaganda unit, where she produced forged Wehrmacht and Nazi rubber stamps while also working on freelance commissions. Her most notable work included patterned papers for Curwen and Penguin Books, decorative borders for the Linotype Corporation, printer’s flowers for Monotype, and calligraphy for the Roll of Honour at Sandhurst. Examples of her work tipped-in. Set in Bembo. Bound in half cream cloth over yellow and green-patterned paper, with a printed paper cover label. 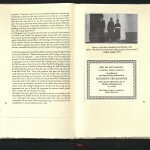 Edition of three hundred and twenty-five copies, signed by the author.